Ravinia relies on your charitable support to expand opportunities for audiences of all backgrounds to enjoy today’s most celebrated artists in a beautiful park setting at affordable prices. 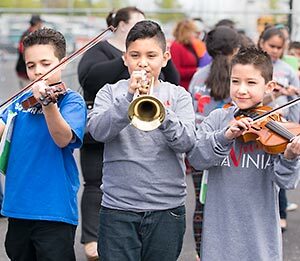 Your gift helps Ravinia spread its mission throughout Chicagoland, working with community leaders, Chicago Public Schools and other scho ol districts to put music back into the classroom through our REACH*TEACH*PLAY® education programs. Ravinia offers a variety of donor benefits, all aimed at making your Ravinia experience as easy and fulfilling as possible. Review the levels of support by clicking on the links in the menu below. Additional restrictions may apply to the above benefits. Charitable contributions to the Ravinia Festival® are not refundable and do not guarantee any benefits or specific concert seating assignments at any level. WANT MORE? Please call 847-266-5461 to learn about sponsorship opportunities. You may be able to double or even triple your gift, giving you increased benefits that come with your new giving level. Need more info? Click here to learn about employer matching gift programs. • Online: Contribute now via our secure web server. • Phone: Call 847-266-5461 to speak to a member of the Development staff. • Stock: Click here for instructions on transferring securities electronically.